Egg freezing is a process where multiple eggs are stimulated to grow in the ovary, extracted, frozen and then stored for future use. Egg freezing gives women the freedom to delay childbearing until they desire or maintain their reproductive capacity in the face of fertility-threatening conditions. The concept of egg freezing is not a new one. However, recent advances in the freezing techniques have dramatically improved success. 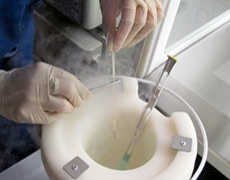 Our Egg Freezing program uses highly-successful vitrification technology. The price for this program is $7950 for a single cycle, 2 cycles for $14,950 or 3 cycles for $21,000 and is all-inclusive (except for medications). For more information about Egg Freezing, please visit www.mfceggbank.com or contact us at 415.925.9404 or info@marinfertilitycenter.com. Please note: These packages are NOT billable to insurance. They are cash discounted cycles and cannot be itemized for any purpose.